You’ve seen Grab conquer the roads, now watch us conquer the SEA. Calling all Anak Malaysia! Who says you can’t compete during the SEA Games outside the arena? Here’s your chance to be a part of our much anticipated 29th SEA Games! 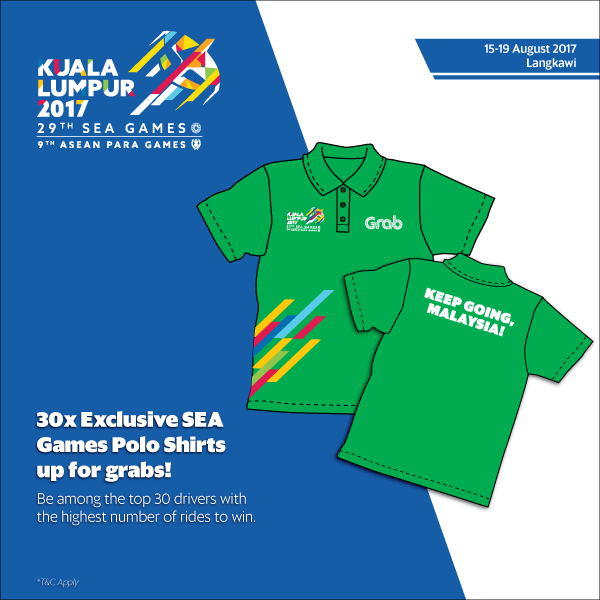 Grab is giving away 30 limited edition Grab x SEA Games Polo Shirts to the top 30 Grabbers with the most rides completed within Langkawi from 15 August – 19 August 2017! No signup is required for this contest as ALL Grabbers from Langkawi are automatically signed up. All you have to do to qualify for prizes is maintain your AR & CR as listed below, and drive, drive, drive. Campaign period: 15 August – 19 August 2017. Contest is open to all Grabbers, full-time or part-time, who have registered and operate in Langkawi only. Applicable to ALL service types. Top 30 Grabbers with the highest number of rides within Langkawi will win a Polo Shirt each. MUST maintain a minimum Acceptance rate of 80% and maximum Cancellation rate of 15% to qualify for prizes. Winners will be informed via SMS by 20 August 2017, with prize collection details included. Each Grabber is eligible to ONE prize each only. Q I am a Grabber who registered and operate in other cities (not Langkawi), am I eligible for the prizes? A No, only Grabbers who registered and operate in Langkawi are eligible. Q Do I need to register to be part of this contest? A Registration is not required for this contest, all active Grabbers who are not banned or suspended are automatically enrolled into this contest. Q How will the contest winners be chosen? A The winners will be chosen by Grab, based on the highest trips taken during the contest period with a minimum Acceptance Rate (AR) of 80% and maximum Cancellation Rate (CR) of 15%. Q When will the winners be announced? A The winners will be announced via SMS after the contest ends. Winners will be informed about the collection details. Q When is the contest period? A The contest is valid from 15 August 00:00 – 19 August 2017 23:59. The Campaign will run on 15 August – 19 August 2017. The Organiser reserves the sole and absolute right to alter or end the Campaign at any time prior to the expiry of the Campaign Period without giving any prior notice and no compensation in cash or in kind shall be given. Langkawi Grabbers whose accounts are active and are not banned or suspended will be automatically enrolled into the contest. No additional sign up is required for this contest.